Rev. Jack Boland was a well-known and much beloved Unity minister and leader of the Unity movement. The Reverend Mr. Jack Boland serves as Minister of Unity of the Infinite Presence in Detroit, Michigan. He was first ordained as a Divine Science minister in 1967. He graduated from Unity Ministerial School and received his ordination in 1972, fulfilling a dream of many years' standing. 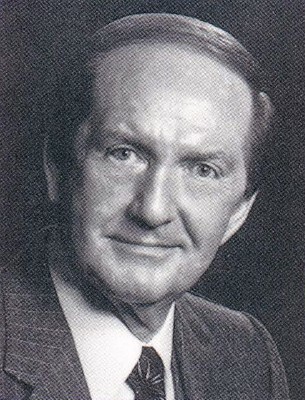 His dynamic qualities as a public speaker and the inspirational effectiveness of his teaching are evidenced in the fact that his Sunday services quickly grew from an attendance of fifty to two services with an overflow crowd of more than 1,000, making it necessary to move the 11:00 a.m. Sunday service to a 1,200-seat auditorium. His Wednesday classes draw a capacity audience of 500 students. Since the present church building can barely accommodate the large numbers of people who attend services and classes there, it became necessary to think of moving to a larger facility. A new building program is thus under way — 13 1/2 acres of land have been purchased and dedicated, architects' plans have been approved and ground breaking is expected to take place in August of 1979. Mr. Boland's ministry is one that stresses spiritual healing, based on his own experiences and his profound belief in the power of the Holy Spirit to respond to the needs of every person. Mr. Boland's Wednesday classes have also become a cassette ministry reaching into the far corners of this country and to every continent in the world. Many study groups have formed using his cassette lessons. Several of these groups have then become the nucleus of newly-established Unity churches or centers. The Unity Cassette Department at Unity Village has published Mr. Boland's lecture series on Prosperity; Reincarnation, Karma and Resurrection; Unity and Alcoholism; The Master Mind Principle; Your Erroneous Zones; and The Science of Goal Achieving for international distribution. Other titles will be released in the near future. His "Dial-A-Thought" has become so well known in the Detroit metropolitan area that 15 answering machines are required to respond to the two million calls received each year. More equipment is being installed. Prior to entering the ministry. Mr. Boland pursued a successful career in sales management and marketing, directing the sales, advertising and public relations of a large corporation considered to be the leader in its field. In his business career, he achieved an identity as a public speaker on the national level. Mr. Boland's business life also included an active involvement with real estate development and investment, and he still holds his real estate broker's license. An important and active facet of his present ministry is counseling with executives, showing them how to solve specific business problems through the application of success principles. Mr. Boland's ministry has extended to the public media with many appearances on television and radio and with the publication of numerous newspaper columns. He is much in demand as a motivational speaker for large corporations and sales organizations, and has been a member of the boards of directors of several successful corporations. He is still a much sought-after banquet speaker and lecturer in the world of business, the world of metaphysics and by many civic organizations. Recognized as an authority in the field of alcoholic rehabilitation and known for his work with recovering alcoholics, Mr. Boland frequently lectures before professional groups who are working to help the alcoholic. He is a favorite guest speaker at Alcoholics Anonymous and Al-Anon conferences, and presently serves as a member of the Board of Directors of the National Council on Alcoholism - Greater Detroit Area. Always eager to provide opportunities that will draw the spiritual community closer together, Mr. Boland sponsors a concert series held each spring and fall in Detroit in the ballroom of a large hotel. Planned as "Cabaret Concerts" with outstanding professional talent, dinner and dancing, these events are looked forward to as highlights of fellowship and fun in the social lives of the more than 750 New Thought ministers, teachers, students and their families who attend. A member of the Board of Trustees of the Association of Unity Churches and a member of the Executive Committee, Mr. Boland has been elected to serve as the President of the Association for 1979-1980. He has previously served as Vice President of the A.U.C. and as Chairman of the Finance and Budget Committee. Jack Boland is enthusiastically supported by his lovely wife, Karen, who gave up her professional career to share his commitment and his work. Mrs. Boland is also an outstanding public speaker and teacher, and she especially enjoys working with groups eager to learn how to change their individual self-images and practice spiritual principles to improve their lives. Jack and Karen love to travel, and Karen frequently joins Jack on his lecture tours. "It was not so much a decision; it was rather an irresistible need for me to share my experience, strength and hope with others and to help them discover their own inner potentials. The Unity ministry provided the perfect field of service in which I could utilize my particular talents and abilities and at the same time further my own spiritual growth. The life of a minister and teacher is to me the most exciting and rewarding of all possible choices. It is the work my heart has always longed for. Of all men, I feel I am the most blessed." A memoriam is not written, nor a memorial service conducted because someone died, but "because someone lived. Jack Boland lived to the fullest extent his body would allow right up to March 4, 1992. The first memorial service for Jack was conducted by the first person who spoke of him after his death, while remembering his life. The first public memorial service was conducted by Michael Murphy on Sunday, March 8, 1992. I will have participated with Michael and others in the second public service on Sunday, April 26, by the time, you read this. 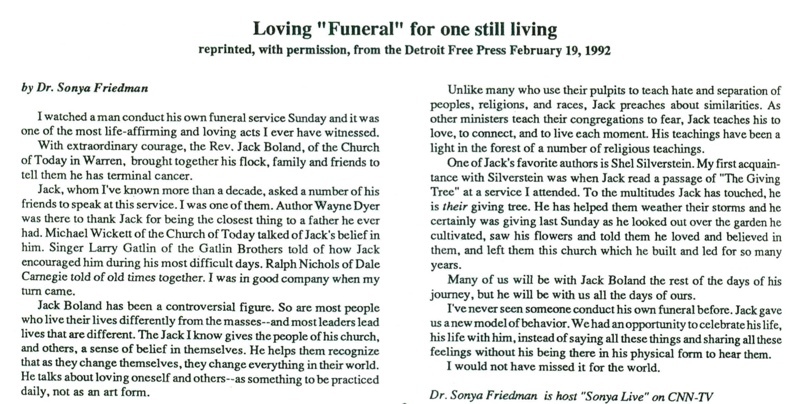 For an accounting of the last service (a kind of funeral service) in which Jack participated, see the Detroit Free Press reprint article, written by Dr. Sonja Friedman, in the April 22 issue of Minister's Letter. The last written memoriam or memorial service will happen when the last person who remembers Jack does so in a way that others may read or hear. Many, will write their own "rememberings"; these are some of mine of the closing days and some of the humorous things Jack said. By the time I arrived home late Sunday night there was a message from Jack, asking me to come see him. I arrived at the hospital about two hours after he quit talking altogether, on Monday afternoon. Others knew what his requests of me were and they conveyed them. I spoke to Jack, and those present agreed the physical reactions (including turning his head to look at me and blinking his eyes) were confirmation that he knew me and understood me. I also spoke briefly of the couple days we shared in early January, two months previously. I stayed the rest of Monday evening in either Jack's room or the Hospitality Room with his family and friends. The stories began about some of Jack's last experiences and last words before I arrived. Already tears and laughter were mixing. On Friday night, Jack received a call from Robert Schuller; after hanging up, Jack decided that would be the last call he would take. He seemed to settle in and said, "OK, let's make this thing (death) happen." He closed his eyes and began breathing heavily while some half-dozen stood about his bed praying. After 15 minutes or so, he opened his eyes and said, "It's going to be awfully embarrassing if I don't die now." On a similar occasion the next day, when he opened his eyes, Jack said, "Darn ... it's hard to give up control." The mixture of tears and laughter throughout the week that followed Jack's death on March 4, and during the Celebration of Life service at the church March 8,1992, marked efforts of family, friends, staff, and congregants to begin healing from a deep feeling of pain and loss. As to the actual recovery from loss, there will be much laughter and many tears for a long time to come. "Darn ... it's hard to give up control."